Gen Con's a great place to make announcements about the games and products you've got coming out soon. It's pretty much a decent chunk of a gaming company's demographic all in one place. 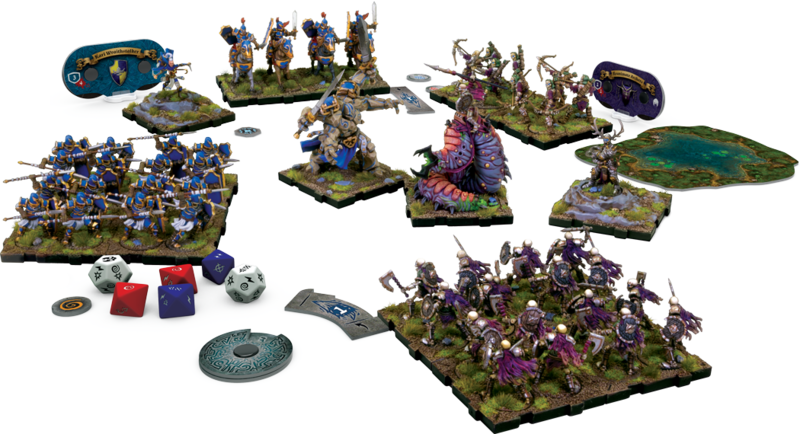 So it's with that in mind that Fantasy Fight Games has just announced the RuneWars Minis Game. Thankfully, even if you're not at the show, you can still find out about it via the new website they put up. 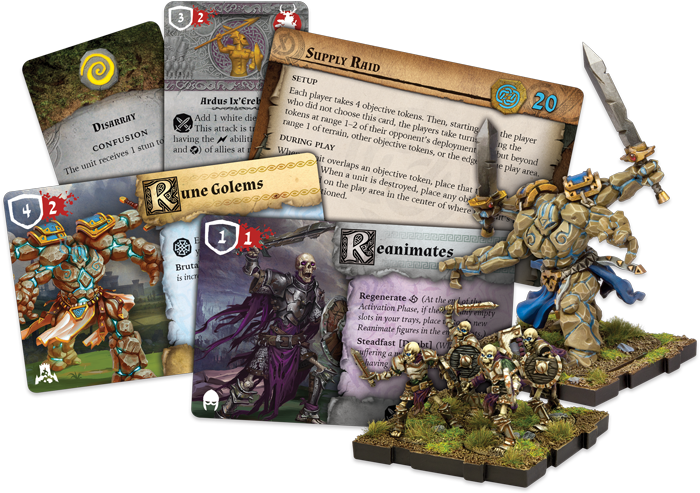 RuneWars takes the magical realm of Terrinoth (that you know from the RuneBound board game) and lets you play out epic battles between armies on the tabletop. The two factions coming out at the start are the Dagan Lords or the legions of Waigar the Undying. Forces are customizable, so you can tailor your force to be just how you want it to be. The game brings a unique command system to the tabletop. It's sort of a spin (no pun intended) on the combat dials in something like X-Wing. Units have two dials, specifically. One's the Action Dial, which you'll set to what actual action you want your unit to do (charge, move, fire, etc). Then, you have the Modifier Dial, which will further define what you do with the Action Dial (gain defense, gain offense, rally, etc). Since each unit has different dials, each unit, even if they seem initially similar, can have a very different play style on the board. So when making up your armies (that promise to be huge and sweeping), you'll be able to make them work just the way you want. That can further be refined by upgrade cards for your units, such as better armor or magical weapons. The figures will come unpainted, so you'll be able to stretch your painting muscle as well. Expect RuneWars to hit tabletops the first quarter of 2017.